During the recent CGIAR Strategic Communications Workshop in Penang, Malaysia, Klaus von Grebmer, Director of Communications, IFPRI, spoke about the need to implement collective communications activities among the CGIAR Centers. In an interview conducted at the conclusion of the first day of the event, he elaborated further. Although the key messages were available and accessible to everyone in the CGIAR System, Klaus does wonder if they couldn’t have gained even more mileage if all the Centers had pooled resources and amplified these messages in their respective regions and from the point of view of their own areas of expertise. A System-wide communications strategy would also require staff to be more outward-looking. 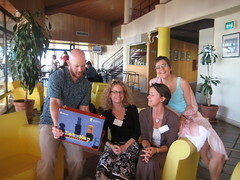 Still, Klaus feels the new CGIAR has an opportunity to address the current lack of a collective communications strategy. IFPRI has recently issued a call for nominations for a new initiative on “Millions Fed: Proven Successes in Agricultural Development.” To submit a nomination or nominations, please visit www.ifpri.org/millionsfed. The Millions Fed project, supported by The Bill & Melinda Gates Foundation, will document evidence on “what works” in agriculture—what sorts of policies, programs, and investments in pro-poor agricultural development have had a proven impact on hunger and food security. We invite nominations highlighting interventions that have had a significant impact on food security, including those that have empowered women and vulnerable groups to improve their livelihoods. Nominations may include, for example, research and extension programs that have improved on-farm yields and outputs for small-scale farmers; public investment programs that have helped food-insecure consumers meet their daily nutritional requirements and accumulate assets; community-led efforts that have conserved soil, water, forests, and biodiversity; or market-based interventions that have strengthened the ability of small-scale farmers and food-insecure consumers to gain access to production inputs, rural services, and agricultural commodities. Please submit your nominations by December 31, 2008. Nominated interventions will be reviewed by a panel of international experts and, if selected, highlighted in the Millions Fed global communications initiative. 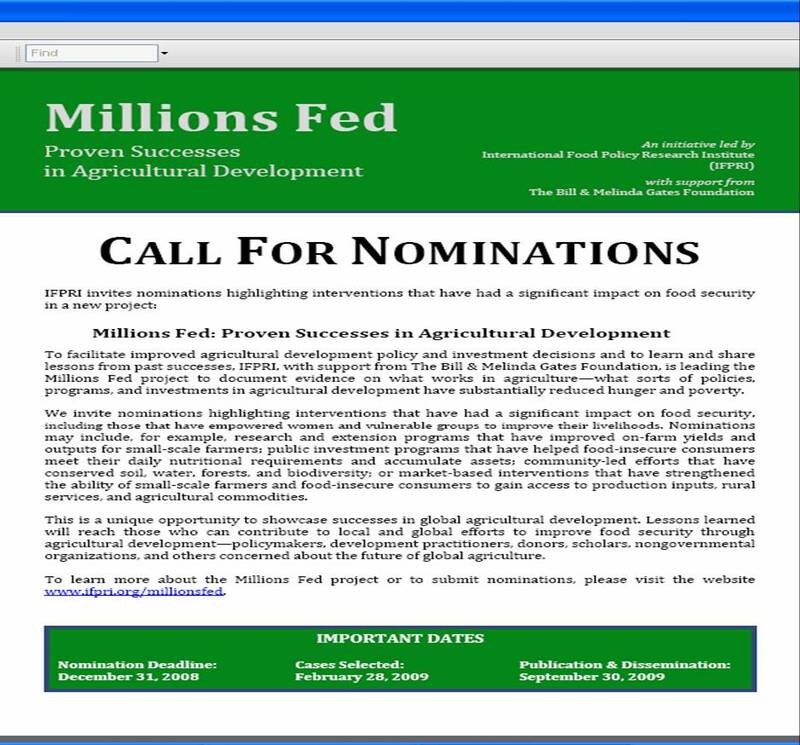 For more information on the selection criteria, nomination process, and the Millions Fed project in general, please see the attached flyer or visit www.ifpri.org/millionsfed. We encourage you to share this call for nominations with colleagues in your organization and networks. Please feel free to contact the IFPRI Millions Fed team at IFPRI-MillionsFed@cgiar.org if you have any questions or would like further information. Andrea Pape-Christiansen from ICARDA. Her participation was sponsored by the Institutional KS project as a means to further foster the KM capacity of a KS workshop participant. Andrea was very interested in the KM strategy discussions that the International Labour Organization (ILO), FAO and Care have been initiating as Open Space topics. Eva Schiffer who just left IFPRI, but will be working with the CG as a consultant. Eva volunteered to lead a session on Day 0, an attempt to map the KM4Dev network and make us realize that we are all linked at some point! (see earlier post) The exercise raised some controversial and rich discussions, and led also to the project of one Open Space working group: Map out our sister and brother communities. Pete Shelton from IFPRI was another participant invited by the Institutional KS project. Pete has proven to be an important resource person for many people in the CG and other agricultural organizations because of his knowledge in ICTs and information management. Not surprising then that Pete went to the techie sessions, like the one on “speading up the Km4Dev Web site”, or the one on “Personal Learning through social networking” or “Using Mobile Phones for KS”. Finally myself. It was my fourth participation in a Km4Dev meeting and every year it proves to be inspirational and energizing. I attended amongst others sessions on KM and the private sector, the future of KM4dev, and I led a session on the KS Workshop and toolkit as a means to encourage developemnt organizations to re-use the materials produced for their capacity building efforts. I also presented a poster on the KS project. More on that in a seperate post…. The Institutional KS Project is proud to announce supporting the participation of two CGIAR staff to attend the upcoming annual KM4Dev gathering. Andrea Pape-Christiansen, in charge of knowledge management at ICARDA, participated in phase 1 of the KS workshop and applied for sponsorship, an offer that was expressed to workshop participants as a means to support further capacity building of “KS champions” in CGIAR centers. “Past interactions with the ICT-KM Program have been viewed as stimulating and beneficial to ICARDA’s work, and I would like to widen this interaction on the KS front by becoming an active member of KM4Dev. Reaching out to this community can help me bridge some knowledge gaps so I can serve the Center better,” says Andrea. Peter Shelton is an Information and Knowledge Management Specialist at the International Food Policy Research Institute (IFPRI). IFPRI has been engaging effectively with KS tools for its internal and external communication and has been a key contributor to the ICT-KM Program through the CGVLibrary project. From the Library and Knowledge Management Unit at IFPRI, Pete acts as an important resource person for many people in the CG and other agricultural organizations by providing pragmatic examples and implementations of web tools to give more visibility and access to CGIAR research. Furthermore, Peter has been contributing to promote KS thinking beyond IFPRI through training, blogs and social networking. “We at IFPRI are looking forward to share knowledge and best practices with KM4Dev, and contribute with our recent experiences. We are specifically interested in the discussion around KM and impact, and to understand the roles of production of knowledge and the roles of practitioners, academics and policy makers and the best ways to reach them.”, says Luz Marina Alvaré who leads IFPRI’s Library and KM initiatives. The KS project is looking forward to their active engagement in the meeting and for Pete and Andrea to feed back their learnings to their Centers, the ICT-KM Program and colleagues CG-wide. As even the “older” generations are getting caught up in the Facebook and social networking mania, it might be interesting to highlight the possible uses of Facebook to the growing, though still dormant, CGIAR network which was set up within the CGIAR by Luz Marina Alvaré from IFPRI, who is always at the cutting edge of ICTs. A growing group of now 147 members have signed up, but the question is… what for? – Establish an expertise database? – Publicize new projects, results, and products? – Share CGIAR staff blogs? I’m sure that the above do not even cover 5% of the possibilities that Facebook could offer our System. So why not explore this further and find ways to strengthen the bonds between center staff? Look at the “IFPRI” model of training and guidance, which consists in once a week face to face and/or distance modules. The ICT-KM Program could prepare a short PPP on the conference for participants to use, enrich, and share with their centers to raise awareness. Share with ICT-KM the Web 2.0 applications used in the CG to start to share them CG-wide through RSS feeds, and have a pool of colleagues to contact to share experiences and know-how.